The Bentley Bentayga V8 has made its official debut, offering a less powerful and likely less expensive alternative to the W12 version currently on sale. The Bentayga V8 features VW Group’s 4.0-liter twin-turbocharged V8, which is making 542 horsepower and 568 lb-ft of torque. The engine is paired with a ZF eight-speed automatic transmission, which sends power to all four wheels through Bentley’s permanent all-wheel drive system. The British brand claims a 0-60 mph time of 4.4 seconds and a top speed of 180 mph, which compares with figures of 4.0s and 187 mph for the W12 model. Carbon ceramic brakes also appear on the V8 Bentayga – a first for the nameplate. The braking system is the largest and most powerful ever fitted to a Bentley, and the largest front brake system available on any production car. The rotors measure 17.3 inches in the front and 14.5 inches in the rear and thanks to 10-piston front calipers, provide more than 6,000 Nm of braking force. The standard brakes are made of iron and are joined by Tornado Red brake calipers. Another first for the Bentayga V8 are 22-inch black painted five-spoke wheels, which are one of 11 wheel options available for the SUV. There’s also a black and chrome grille and a black-finish quad-tip exhaust, which further set the V8 model apart from the more luxury-focused W12 model. The interior also gets first-time equipment in the way of carbon-fiber trim, available wood or hide-trimmed steering wheels and available ‘Cricket Ball’ brown leather. 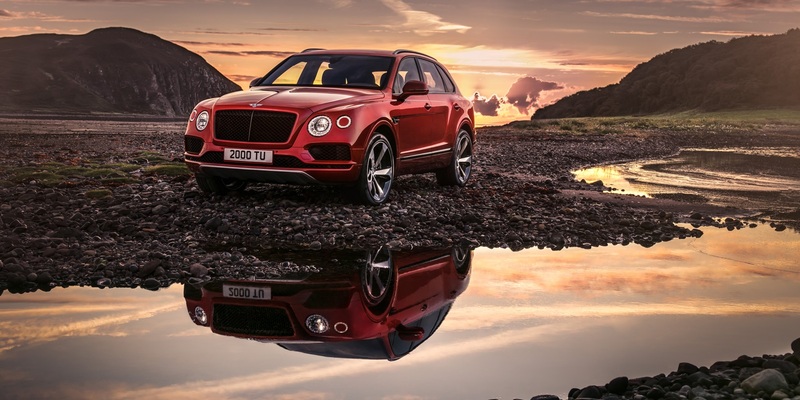 Price figures and availability dates for the Bentayga V8 are not yet available.